North of Downtown Miami and adjacent to Edgewater, Wynwood is becoming the hottest place for commercial real estate in South Florida. The urban neighborhood is split into Wynwood Art District and Wynwood Fashion District, and also contains its recently born technology district. 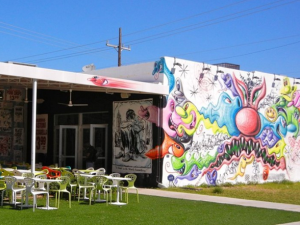 The Wynwood Art District contains over 70 galleries, museums, and other art collections. During “Art Walk”, which takes place the second Saturday of every month, Wynwood galleries and studios open their doors for public viewing. Wynwood Walls is another well-known attraction. “The Walls” is a permanent outdoor mural exhibit that features some of the world’s most distinguished street artists. Wynwood Fashion District—Miami’s Fashion District—is located within the larger Design District of Wynwood. The Wynwood Technology District is undergoing gradual development as tech start-up companies continue to rush in and find their place. The LAB Miami, a campus for social and tech innovation, appears to be the trailblazer for this technology movement in the fast-growing art niche. The demand for this area will increase dramatically as more people begin investing in innovative technologies. Just recently, the Miami New Times moved its headquarters to Wynwood.